Ensiferum are one of my favourite bands - hell, they're second only to Iron Maiden in terms of my Last.fm scrobbles - so it's fair to say I was looking forward to this show that little bit more than usual. Most bands of this calibre seem to play at Islington Academy these days, a venue I vaguely dislike, so I was happy to be heading to the superior Scala for tonight's gig. Both of the support bands on this tour were in the 'heard the name but not the music' category for me and I was interested to see what Tracedawn had to offer, as I remember their name being on this year's Wacken bill. Unfortunately, thanks to a rather slow-moving box office queue, I rushed into the main hall of the venue just as the band were playing their final notes. They seemed to have a half-decent amount of people clapping and cheering their performance, so had obviously gone down well with most in the room, but a friend who did catch their set described them simply as "okay". A browse of their Myspace page suggests I wouldn't have been over-enamoured with them, as their brand of melodeath is not something that excites me at all - still, it's a shame I can't tell you more about their live show, but if you're into melodic death metal with plenty of mainstream-pleasing clean vocals then check them out. 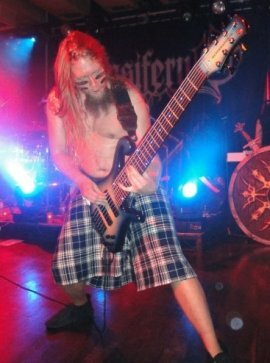 Having read in an Ensiferum interview prior to the gig that Metsatöll were hand-picked by the headliners to join them on tour, I had assumed they were fellow Finns. In fact, this four piece hail from Estonia and have recently been signed to Spinefarm (home of Ensiferum), which makes their appearance on the bill all the less random. Starting off their set with (presumably Estonian) chanted vocals, each member building upon the others, it's clear we're in for some very folk influenced metal, with the likes of Skyforger and Månegarm springing to mind. However, whereas those bands - and many others in the burgeoning folk metal scene - are mainly a mix of grim black metal and folk, Metsatöll tread a more traditional, and perhaps more authentic, musical path. Don't get the wrong idea here; they still employ the basic guitars/bass/drums setup and the core of each song played featured heavy metal riffing that flitted between black, thrash and trad influences. 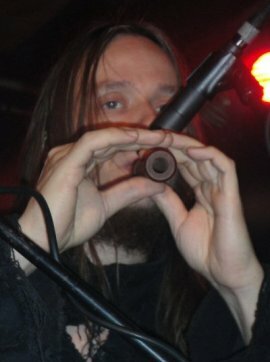 What made their sound interesting though was the use of traditional folk instruments by multi-instrumentalist Lauri Õunapuu, the most prominent of these being 'torupill', Estonian bagpipes. Along with whistles and a strange looking stringed instrument that resembled a primitive cross between a harp and a guitar, these provided driving melodies that got many heads nodding. 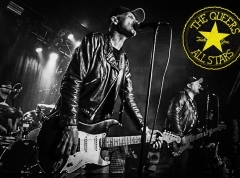 The majority of the singing was handled by guitarist/vocalist Markus Teeäär, whose earthy tones and abundant enthusiasm had those gathered near the stage pumping their fists and chanting along during the decidedly metal call and response section. Unsurprisingly with a band I had not heard before and whose material is entirely in Estonian, I have no idea as to song titles, but the highlight of the set for me was the last song performed. This included a fantastic part which again saw the members using their collective voice to great effect, with a massive and atmospheric sound achieved. Whilst this sort of folk metal may not be unique any more, Metsatöll are certainly worthy of more attention (they've been around for a decade) and provided an interesting and entertaining warm-up to the night's main event. After replenishing my supply of over-priced lager and staring in disbelief at the even more over-priced merchandise (£50 for a hoody...bloody euro exchange rate!) it was time for Finland's finest Viking warriors to take to the stage. Last time the band graced our shores headlining the Paganfest tour package they brought the Scandinavian weather with them; London being covered in an (albeit thin) layer of snow. No such conditions were present this time around, which was almost a shame given Ensiferum's current artwork has an icy theme, but probably for the best considering the capital's inability to function when a few white flakes fall from the sky. Moving down from the raised level I had been watching Metsatöll from to the main floor, where the atmosphere is best at any gig, I found (as is usually the case at the Scala) there to be plenty of room and took up station near the right-hand speakers. After an atmospheric intro tape (which I'm sure wasn't new album opener "By The Dividing Stream", despite that making the most sense) Ensiferum burst into the title track of their latest effort "From Afar". As this is a fast-paced frenetic affair to begin with, the sound was a bit chaotic and confused but it only took a few bars for the soundman to do his job and we were given a spot-on mix for the remaining hour and thirty five minutes. Following the album track-listing, "Twilight Tavern" was played next and provided the first of many fist-pumping sing-along choruses, highlighting it's status as one of the best tracks on the album. In fact, the set-list included all but one of the songs on "From Afar" (discounting the bonus track), and although that sounds like an overdose of new material the set didn't feel skewed - a testament to how well the new stuff fits in with Ensiferum's excellent back catalogue. Speaking of the back catalogue, next we were treated to a ripping rendition of "Little Dreamer" from the self-titled debut album, which received noticeably louder cheers than the previous songs. With its infectious galloping melody it's the kind of song that makes me wonder how anyone can dislike Ensiferum. I should probably mention some other things before this just deteriorates into a fanboy list of every single song played. 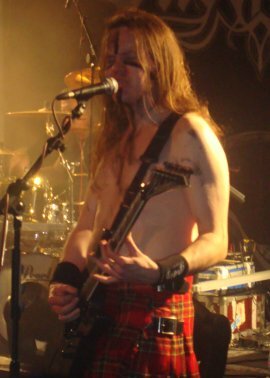 Overall, whilst a bit sparse around the edges, the crowd certainly filled the venue a lot better than the almost embarrassing crowd-to-venue-size ratio of Ensiferum's last album tour in 2007, when they played the far too big Fridge in Brixton. The Scala audience also reacted far more energetically and enthusiastically, with most shouting along to every song, although probably not as tunelessly as myself. 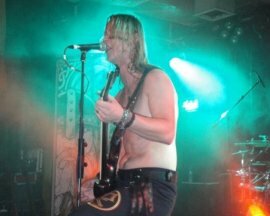 With many of the vocal passages requiring all three of the guys up front - frontman Petri Lindroos, guitarist Markus Toivonen and bassist Sami Hinkka - Ensiferum aren't a band that ceaselessly charge around the stage, but plenty of headbanging and crowd eye-contact ensured they put on an entertaining show. It was Hinkka that really seemed to be enjoying the moment, throwing himself into all sorts of bass-wielding shapes, flashing the horns and disappearing from view (thanks to the low stage) as he launched into bouts of vigorous windmilling. The fairly lengthy set seemed to fly by as I found myself lost in the music as can only really happen with a favourite band. The songs came thick and fast with choice cuts from each album highlighting how consistent Ensiferum have been in the song writing department thus far in their career; although many fans still lament the loss of original frontman Jari Mäenpää, this really hasn't been of detriment to the band in my view (and considering we are still waiting for the next Wintersun album, maybe it was for the best!). Despite such a strong clutch of songs on display, it was "Guardians of Fate" that really stood out as track of the evening; the atmosphere becoming even more electric and jubilant. After the epic "Treacherous Gods" and "Lai Lai Hei", a final encore of "Iron" saw Petri engage the audience in a round of 'you can do better than that!' chanting to the main "dud da da dur, dud da da dur!" melody of the song and whilst the effect wasn't quite as epic as at Wacken last year it was certainly a lot of fun. It rounded of a set that is more than likely to feature in my top ten gigs of the year and as I spilled out into the cool London night I was left craving more live Ensiferum. Here's hoping they're booked for Bloodstock.